We booked our Virgin Atlantic flight for 40,000 miles (transferred from Chase Ultimate Rewards) and £364 per person, shortly before Virgin’s recent program devaluation. Since the flight was departing early in the morning and we wanted to get back on New York time, we decided to stay up the night before the flight and sleep on the plane. After a relaxing time in the Virgin Atlantic Heathrow Clubhouse, we boarded our New York-bound flight through door 2L. We were greeted by friendly flight attendants and directed left to the Upper Class cabin. The interior of the plane felt posh with a futuristic vibe, thanks to Virgin’s material and lighting choices. My first thought was, “wow, there are a lot of business class seats stuffed into this cabin”. There are 31 herringbone-style “suites” on the airline’s 787s, between doors 1 and 2. Virgin was one of the first airlines to install flat-bed business seats, all with direct-aisle access in their fleet. While the seat and cabin finishes have been modernized over the years, the configuration itself feels stale compared to reverse herringbone business cabins found elsewhere. The 787 windows were large and bright, peeking over the tops of the seat backs. Seats are configured in a 1-1-1 layout across 11 rows. On this aircraft, the left aisle only serves the A seats, while the right aisle serves both the middle (G) and other window (K) seats. Therefore, I’d recommend sitting in an A seat for the most privacy and least traffic along the aisle. The seat itself has comfortable cushions, but is quite narrow - especially at the shoulders. The seats are heavily angled towards the aisle, making it difficult to see out the windows and reducing the feeling of privacy. I felt as though I was on display: even being of average height, I could make eye contact with nearly every other passenger in business class. Each "suite" has a personal reading light, small magazine pocket, cocktail table, IFE monitor, handset controller, and single power port. I appreciate that the designers of these seats had to fit so much functionality (and so many seats themselves) into such a small space, but the compromises made are sometimes mind-boggling. For example, the small cocktail table is located just behind your shoulder, making it awkward to reach and easy to accidentally spill. The IFE monitor arm sweeps across the open tray table, making it easy to push things off. The single power port is difficult to access - it’s recessed inside the magazine pocket at hip level. There is very little at-seat storage: a single, thin magazine pocket and small cubby in a retractable armrest are all you get. Because of the placement of seat features and the narrowness of the seat, there is a constant need to contort and twist to see or interact with things. And good luck trying to get up to use the lav when your tray table and monitor are deployed. Each seat has a fixed ottoman which can be used even with the seat fully upright, which is nice.The position of the ottoman relative to seat neighbors can present issues: the man in the seat next to mine promptly removed his shoes after boarding. His feet had a terrible odor that was noticeable throughout the flight. Also, this made me extremely aware of just how close he was - his toes were wiggling just a few inches from my knee! Yuck! I much prefer for everyone's feet to be tucked away in a ‘cubby’ in a reverse herringbone configuration, even if it means less room to move them around. Thank goodness this aircraft had air vents at every seat; I made good use of them. Another quirk of this seat is that to convert from seat to bed mode, you must stand up and hold a button, which slowly flips the seatback forward, revealing a mattress-like surface. Some passengers love this, as it means a dedicated, uniform sleeping surface. While I don’t mind standing up to convert the bed, it’s nice to be able to go from semi-reclined to flat and back throughout the flight while remaining comfortably seated. The flight attendants are usually quick to offer to make the bed while you use the lavatory or start the conversion process on your own, though. Once in bed mode, I found the padding to be quite comfortable, since there were no big seams or unevenly worn cushions. As a side sleeper, I did find the curvature of the space to be cramped, with my knees often hitting the side of the seat. The linens and pillow were of nice quality. I quickly fell asleep, being awoken a couple of hours into the flight by my neighbor's voice. He was on a video call with his daughter on speakerphone! It's amazing how some flyers can be completely oblivious to others around them. At least we know that the wifi was working well! Virgin's selection of in flight entertainment content was good. The screen itself was smaller than many current competitor's, feeling more in-line with what you'd see at a modern economy seat. The screen can be positioned quite close to you, which can help offset it's small size. Since we went to sleep immediately after takeoff, we skipped the breakfast meal. I awoke again about 2 hours before landing as the second light meal was being served. I was first offered crisps (chips) and a beverage. I chose tea. The flight attendant then offered a selection of finger sandwiches, of which I chose the vegetarian cucumber variety. 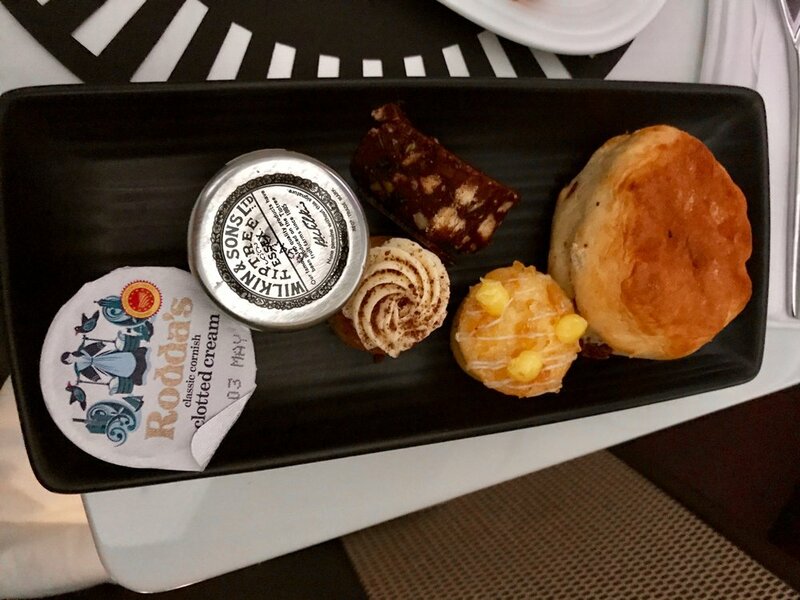 A biscuit and some bite-sized pastries were also presented. The quality of the food seemed fine, though I'll reserve full judgement since I missed the main meal earlier in the flight. While seated in separate seats, there is no easy way to converse with a travel companion; sitting across the aisle from one another will leave you talking to everyone around you, while sitting next to one another will leave you craning your necks. The most cozy option may be to eat face-to-face at one seat, though in practice, this may be somewhat uncomfortable for the person on the ottoman. 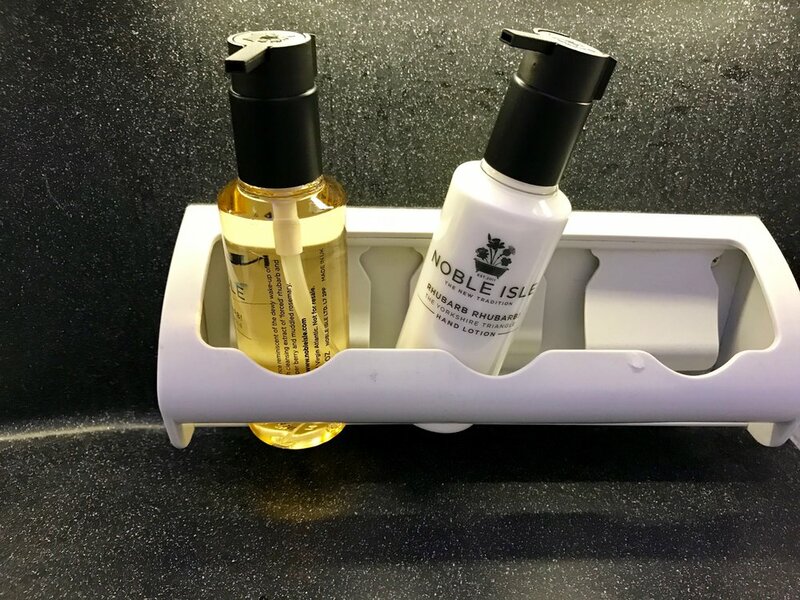 The bathrooms seemed to have standard-issue Dreamliner finishes, with a few Noble Isle products on offer. The amenity kits were Herschel pouches with pretty standard contents. 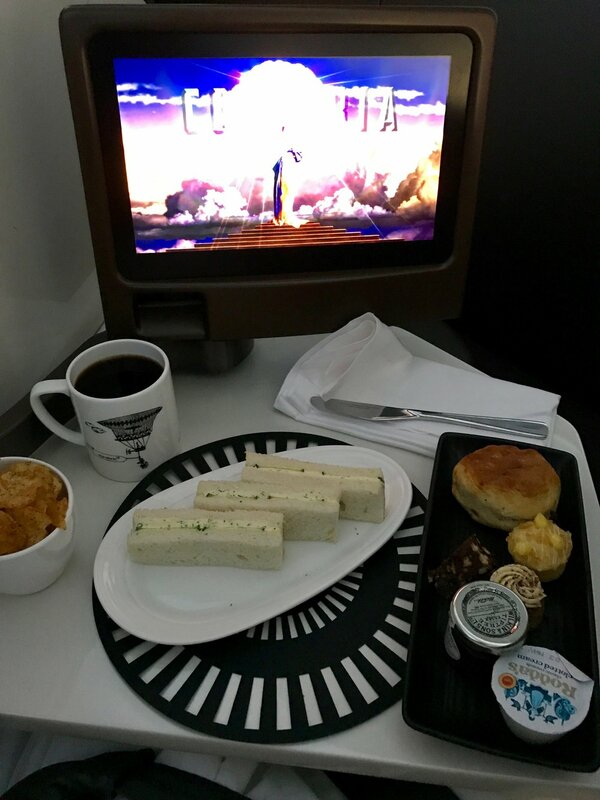 Virgin Atlantic Upper Class has some real strengths and some serious weaknesses. The company certainly knows how to convey a consistent, hip vibe across their brand’s touchpoints - every interaction feels posh and polished, with clever touches abound. I found the service to be excellent on this flight. 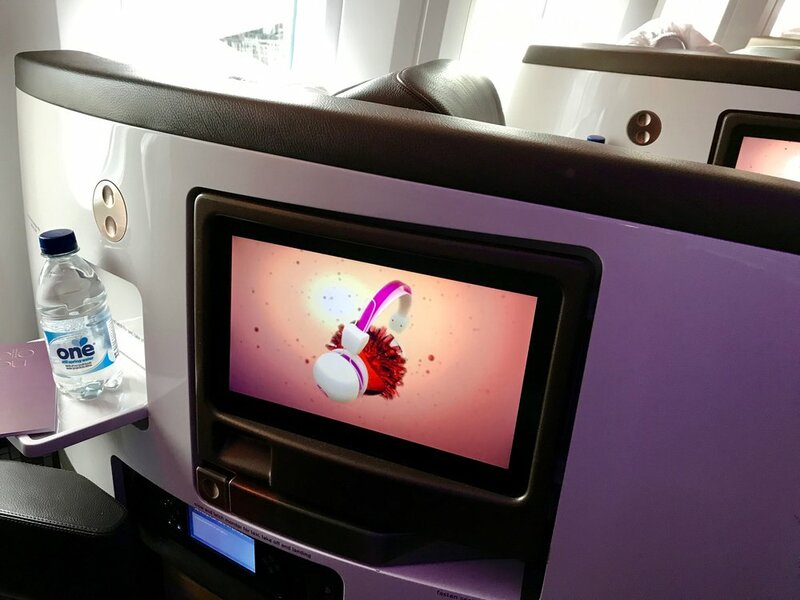 Virgin Atlantic's main weakness is their Upper Class seat. It feels exposed, narrow, and poorly laid out. The competition has made huge strides in upgrading their long-haul business class seats over the past 5 years and Virgin would be wise to pay attention. Their stylish atmosphere can only distract for so long; once you realize you have an inferior seat, bed, and entertainment screen, the less hip airlines' products start to sound more appealing for long-haul international travel.